“Lovely space, really nice work” – a recent comment from a visitor to our gallery and stained glass studio in Northamptonshire. By now, most people will have seen one of the many Facebook memes going around telling us that every time we buy something from an artist or craft maker we buy a little piece of unique creativity, directing money in to the local economy, helping those artists survive and continue to enrich our lives. Well, of course I agree with the sentiment, even if I find the memes themselves often a bit saccharine. 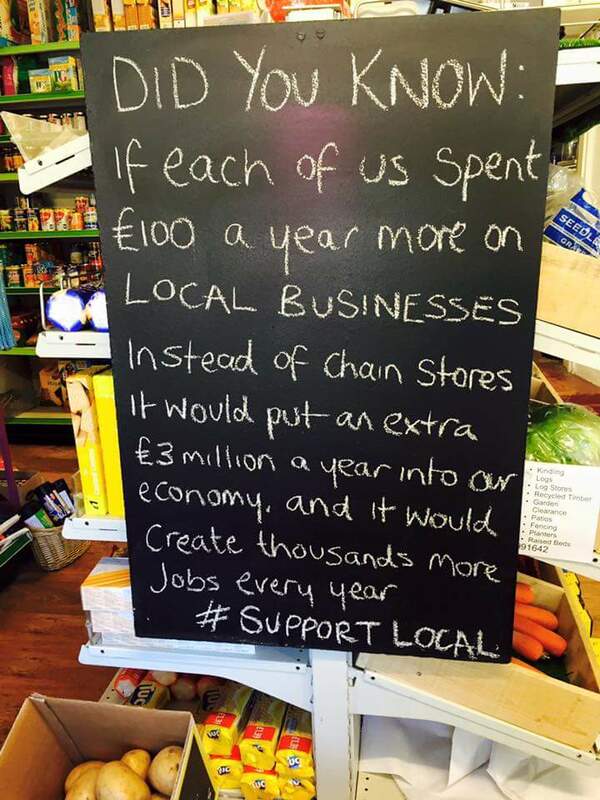 And just recently I’ve seen several blog posts from independent shop owners reminding us that small shops and independent cafes or restaurants need to be supported if they are to survive. Every day something seems to make the chances of survival for small retailers a little poorer – out of town developments, parking restrictions in our towns, tax law changes that give large multi-nationals an unfair competitive advantage. 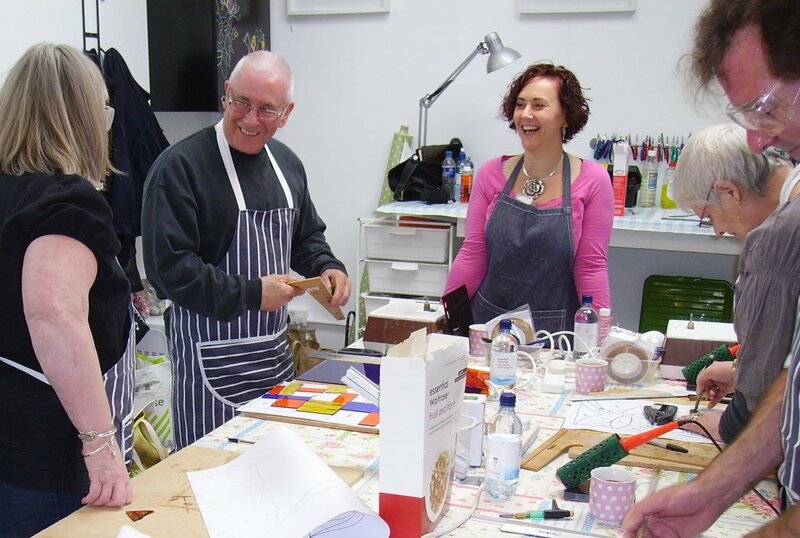 By design, our business at Vitreus Art is not dependent only on sales of art and crafts – we have a well-attended programme of craft courses plus the art holidays we run in Cornwall and a steady stream of stained glass commissions to keep us busy. But as a small business we still face many of the same challenges and so we’d like to invite you to help all small retailers continue to offer you nice things the big chain stores don’t! So what can you do to help keep Britain’s high streets and shopping centres vibrant and independent? If you see a piece of art in a gallery, or something handmade and delightful, or are tempted by a delicious-looking cake in the window of a tea shop, don’t say ‘I’ll come back and get some Christmas presents later / bring my friend to tea here next year’. How about buying that piece of art now if you can afford it (art is its own reward!)? How about biding a while now with a cup of proper tea and a slice of home-made cake?How about getting a huge headstart on the December crowds by buying your Christmas presents now, when you see them, from a crafter at a fair, or a local art gallery or handmade gift shop? If you’re in the market for original, collectable art, buy art created by an artist who’s still alive – the dead ones don’t need the money! History is littered with musical geniuses and artists who died poor and then got rich! 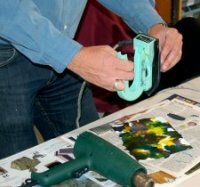 Instead of waiting for your retirement to try a new craft or take up paint brushes, find a spare Saturday or evening, book yourself on an art or craft course and start creating straight away. Imagine how skilled you’ll be when you do retire! If you’re on a tight budget, instead of buying greetings cards (printed in high volume overseas) from high street chains (whose designers and artists receive a mere fraction of the price you pay) buy your cards from a local gallery or gift shop. I can tell you for every card we sell in our gallery at Wakefield Country Courtyard, the artist gets a useful reward for their work, and not just an insultingly tiny percentage! Tell your friends about what you’ve done! Share the business’s Facebook page, join their email newsletter and spread the word! By doing these things you’ll be playing a part in keeping an artist alive and you’ll be helping the gallery or shop owner stay in business. If they thrive, that’s one less ‘lovely space’ with ‘really nice work’ in danger of becoming a betting shop or tax-avoiding-paying chain coffee shop! And we have greetings cards! With spring tentatively springing and most of us emerging from hibernation it feels like it’s time to turn the creative dial up a bit! We’ve got lots of fun classes to offer you, new art work in the gallery and some events we hope will get you out and about in the NN12 7QX area! How about getting to grips with Mixed Media? Clare Tebboth’s new one-day class will expand your artistic horizons and is suitable for beginners and established artists alike. Or for the complete beginner, Clare Tebboth’s Painting & Drawing for Beginners will boost your confidence and inspire you to start creating your own masterpieces. 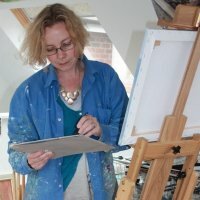 Clare will introduce you to a range of essential techniques including sketching, colour mixing and brush control, use of watercolours and more. The course takes place over one morning per week for 5 weeks. Clare Tebboth Mixed Media Madness, 9th May or 6th June £65 per person including materials and lunch. Clare Tebboth – Painting & drawing for beginners, 5 week course, mornings, £85 for all 5 sessions, starting 24th April, including materials. We’re delighted that Phil Madley (artist and encaustic wax evangelist) is to be running his highly-rated one-day class in our studio. You will use heated scribes, wax irons and coloured waxes to produce abstract art as well as exploring natural subjects via this unusual (and ancient) artform. Materials are provided and the class is suitable for beginners. Encaustic Wax art with Phil Madley, Weds 22nd April & Saturday 2nd May, £70 per person including materials and lunch. And for everyone interested in working in 3d, take a look at what you can achieve on Liz Dixon’s Textile Sculpture classes. 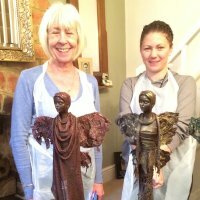 Liz will demonstrate the use of textiles and Powertex resin to create unusual figures and sculptures. As with all our classes, materials are included, and so is fun! Liz tells us that many of her students go on to make more sculptures at home after her classes! Textile Sculpture with Liz Dixon – 20th June, £95 per person including all materials and lunch. And for the budding stained glass artists, we’ve added some additional beginners class dates for both leading (aka garden panels) and foiling – the next foiling classes with places available are on 27th June and 25th July, leading on 4th April and 30th May. These are all suitable for beginners and cost £125 including all materials and lunch. And for something glassy but a little different from our stained glass classes, how about learning the art of glass appliqué? Appliqué has been described as ‘see-through mosaic’ and is easy to do at home too. Jenny will teach you how to use appliqué to make pictures in glass as well as decorate a mirror or a simple glass vase on these Tuesday classes. 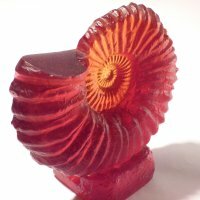 Glass appliqué with Jenny Timms – 7th April and 5th May, £60 per person including all materials and lunch. All our classes are limited to 6 places (5 for stained glass) so early booking is advisable. On 3rd April (Good Friday) we’ll be running free stained glass taster sessions for anyone who’d like to have a go at making a simple piece in the foiling method. Each session lasts about 90 minutes. Get in touch to reserve a time slot soon as places are limited! Also on Good Friday several of the other businesses at Wakefield Country Courtyard are running events. Join the friendly folks at Upton Smokery for their tasting day – sample local deli produce, pies, cider and beer, smoked meats and fish and all sorts of tempting goodies! The ARTea Rooms are running afternoon tea with sandwiches, tea and cakes (as road-tested by Jenny and her Mum recently!) and pet owners can have their pets photographed by local photographer Barefoot Photographics at Bark N Purr pet boutique. Have a look at the Wakefield Facebook page to see what’s going on! Our gallery will be open 10-5pm on Good Friday, Saturday and Easter Monday, closed Easter Sunday. A bit further ahead but definitely one to put in your diary – how about visiting some artists during Bucks Open Studios in June? BOS is a 2-week-long festival of Art throughout Buckinghamshire during which we’ll be offering taster sessions, running classes and showing new stained glass plus a few surprises that we’ll hint at in future newsletters! Last year’s BOS involved 500 artists exhibiting at 200 venues and this year’s season is expected to be bigger yet. This year’s event runs from June 6th – 21st and all exhibitions are free to enter. There are no prizes for telling us that our gallery / studio is in Northants! Continuing our policy of displaying work from the best local artists, we’ve just added cute animal and bird acrylic & paper framed art and jewellery from Sophie and amazing cast glass ammonites from nationally recognised Tlws Johnson. All our work is affordable with prices starting at £5 and appealing to tastes from serious to frivolous! Finally – we’re currently taking commissions for stained glass mirrors – just tell us what kind of shape, what size and colours you’d like and we’ll do the rest. Prices start from £50 for square mirrors. We hope to see you at our gallery soon! P.S. We’re delighted that the popularity of Poldark is generating new interest in Cornwall – we’ll be visiting some of the best locations seen on screen during our painting and photography courses in September. Later in the series, some of our favourites – Gunwalloe (or Church Cove) and the Crown Mines at Botallack – feature in dramatic scenes (no plot spoilers here). Mike and photographer Stuart Grieve were scouting for locations for this year’s 3 day photography workshop while the series was being filmed and we bumped in to camera units at several of our chosen locations! 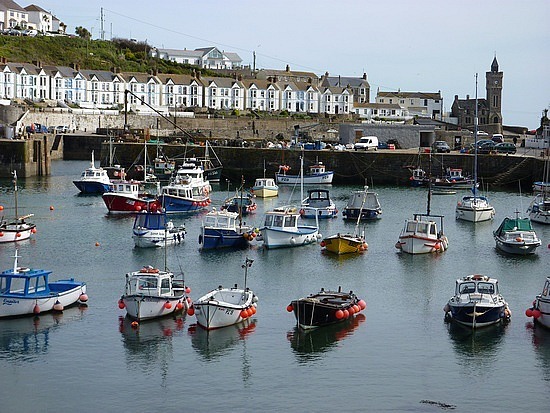 We have a few places left for both painting and photography in Porthleven in September – details here! We’ve always been a little suprised at how many people have visited Porthleven, Britain’s most southerly working harbour. We’ve known the place and the fantastic scenery it nestles amongst for ages – first as holiday visitors far too many years ago to reveal, and more lately as the location for our 5-day stained glass courses and some of our new business opportunities too. Now there are a whole lot more people who know something about the place. And what they know is probably that the little village has been battered by the recent storms. There have been TV shows broadcast from the head of the harbour; Radio 4’s Today programme was presented from delightful ice-cream parlour and cafe Nauti But Ice; photos and videos of waves crashing over the roofs of houses by the harbour have been seen in every reputable newspaper and news website. 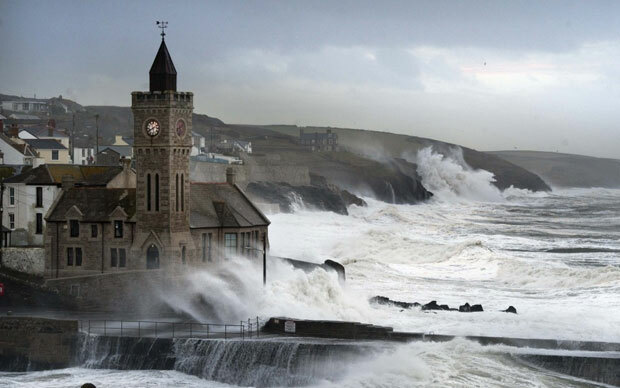 Like much of the south west, Porthleven and countless other lovely places have been pummelled and will need a lot of repair – just as soon as the storms have died down. When the storms have dissipated and the sea is calmer, the fishermen will be out in their boats, the many excellent cafes, pubs, restaurants, independent shops and galleries will be open and, with a bit of luck, the sun will be warming our skins once more. The British coastline with all its varied beauty is truly an asset for our country. 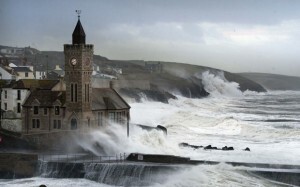 We invite anyone who’s seen photos of Cornwall receiving the full force of extreme tides and winds to make a point of supporting the people who live and work in places like Porthleven. Get out and enjoy our natural and man-made heritage, feel that refreshing salty air on your skin, spend some of your holiday money in our own country where it will do us all some good! In a future post I’ll write a little about the art holidays we run in Porthleven. Until then, our thoughts and best wishes are with anyone who’s been affected by this year’s storms and flooding. To share your craft…. Or not? A guest post by Jenny Timms, Vitreus Art. 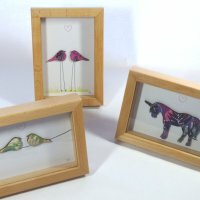 As you may know I am one half of Vitreus Art – a small stained glass art studio based in Buckinghamshire. We design and make stained glass art to be displayed in the home,in windows or the garden. We make pieces ranging in size from small simple sun-catchers to large statement, privately commissioned work. Mike (the other half, of Vitreus Art!) 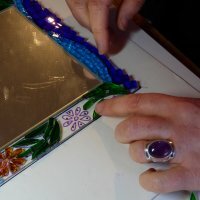 and I started our company a few years ago after taking a one day stained glass course. This was after seeing some glass work which we both really liked in our favourite place – Porthleven, Cornwall (pay it a visit sometime, it is the most Southerly Harbour on the UK mainland – and it’s a wonderful place). Mike and I now teach our craft (or is it an art form? That I think is another question to look at another time). Well, maybe we are, but I don’t mind. It’s taken us sometime to get to where we are, so I think it will probably take our students sometime to catch us up (I hope!). In years gone past people would have learnt the craft – which was needed back then to create windows for the home – by being trained as an apprentice or by the craft being handed down from father to son. But that is no longer the case. If you want to learn the craft of stained glass art you have to study at college or like us take a simple course and follow that up with years of practice. Personally, for me I think it is important to share this craft with others, as otherwise it risks being a dying art form. Both Mike and I get an immense amount of pleasure seeing our students arriving in the morning with little knowledge of what they will be going home with at the end of the day, and then seeing them leave us exhausted, but having achieved so much, in just 8 hours! They will have learnt many new skills and will be taking home a beautiful piece of art work which we hope they will treasure for many years to come. Some of our students will go on to take up the craft; others may tell their friends about the course. We’re always delighted to hear from past students who have bitten the bullet and bought a set of tools and started making pieces! Even if they do no more glass work, their friends may join us and take up the craft – so one way or another this chain will go on and the craft thrive. So for me, yes, it is important to share the craft, and I hope others agree. Get in touch or leave a comment and tell us about your craft experiences!